Photo: Victor Bryant Rodney Boone surrendered one hit in his 7 1/3 innings on the mound. 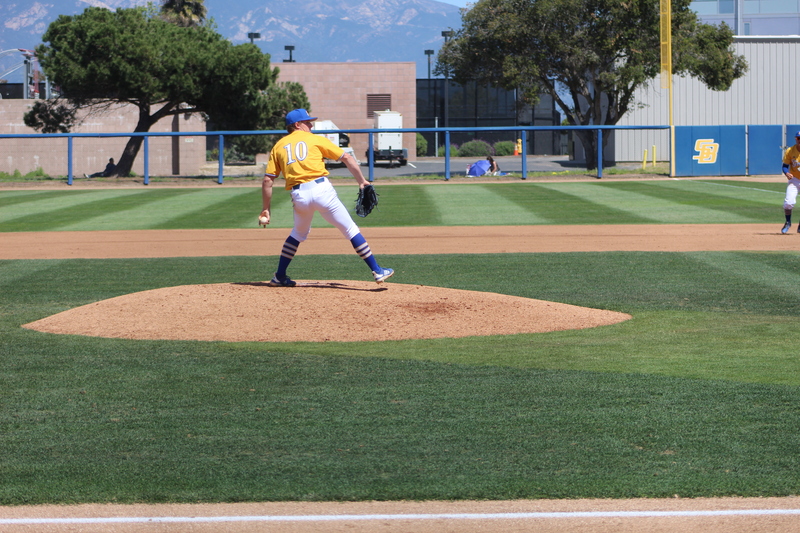 Freshman left hander Rodney Boone surrendered just one hit in 7 1/3 innings on the mound and the UCSB baseball team completed a three-game sweep of Stephen F. Austin with a 7-0 victory on Sunday afternoon. The matchup with Stephen F. Austin was the final non-conference weekend series of the season for the Gauchos and after two hard fought victories to open the series No. 19 ranked UCSB imposed its will in Sunday’s finale. “We didn’t score a little bit early and (Boone) continued to get zeroes and I think it took some pressure off the offense so they didn’t feel like they had to score ten (runs) today,” said UCSB head coach Andrew Checketts. Boone not only kept runs off the scoreboard, he also carried a no-hitter into the top of the eighth inning. His teammates and the crowd were well aware that they were witnessing a potentially historic performance, but Stephen F. Austin catcher Skylar Black spoiled the no-hitter with a softly hit jam shot into right field. “I missed my spot there so (Eric Yang) was disappointed that I missed my spot, but we’ll get it next time,” said Boone of his catcher’s reaction to the Lumberjack’s first hit of the game. Eric Yang makes a diving catch against the netting behind home plate. It was the seventh start of the season and third victory without a loss for Boone, who has integrated seamlessly into the UCSB rotation in his first year on campus. Boone’s veteran teammates have contributed to his success. “I talked to Ben (Brecht) and Jack (Dashwood) about where they were hitting the ball and they told me to command inside and out the fastball and that was my goal today,” said Boone of the advice he received from the UCSB starting pitchers earlier in the series. As for the UCSB offense, a slow start was mitigated by Boone’s brilliance. Thomas Rowan opened the scoring in the bottom of the fourth inning with a solo homerun over the netting in left field. Later in the inning, a one out double by Andrew Martinez was followed by a single through to left field Jason Willow that brought home Martinez and increased the UCSB lead to 2-0. Rowan and Martinez drove in runs in the bottom of the fifth inning on a sac fly and single to left field respectively, increasing the lead to 4-0. The Gauchos tacked on three more runs in the bottom of the eighth inning as the Lumberjack relief pitchers struggled with control. UCSB (23-5 overall, 2-1 Big West) will travel to Pepperdine for a non-conference game on Tuesday before opening a crucial three-game series at home against UC Irvine on Friday.